"A World at Prayer is a World at Peace"
This map highlights the countries where Father Peyton hosted Rosary Rallies. 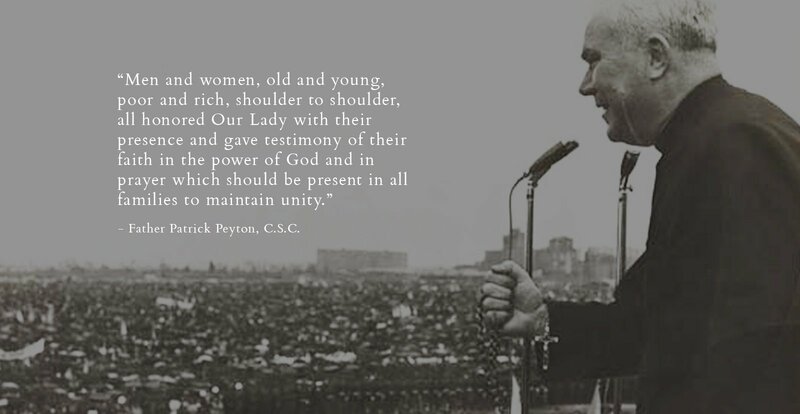 Father Peyton speaking at a 1958 Rosary Rally in St. Paul, MN. 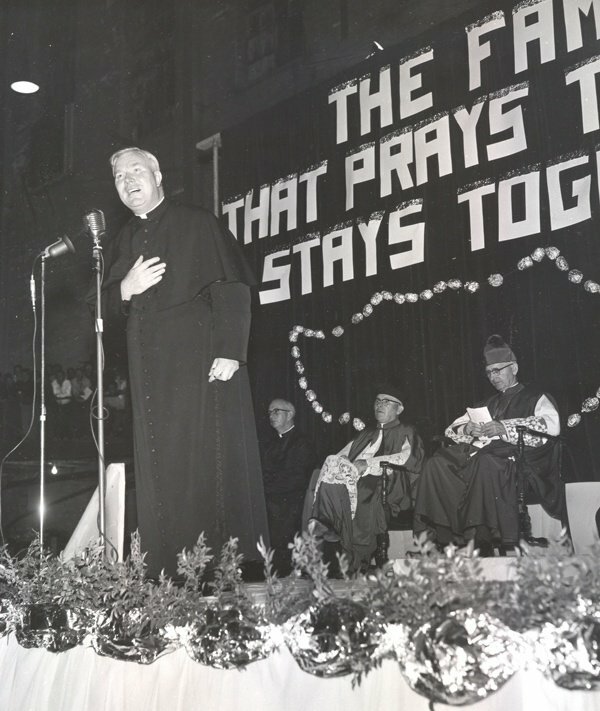 In 1948, after a providential meeting with priests in Canada, Father Peyton was invited by Bishop John T. Kidd of London, Ontario in Canada to hold a rally about family prayer. This was the first of 260 rallies worldwide led by Father Peyton. The Rally in Canada was a huge success where over 80,000 families, 95% of the diocese, pledged to faithfully pray the family Rosary. Father Peyton had made the first inroads in his original plan to bring the Family Rosary to 10 million families. 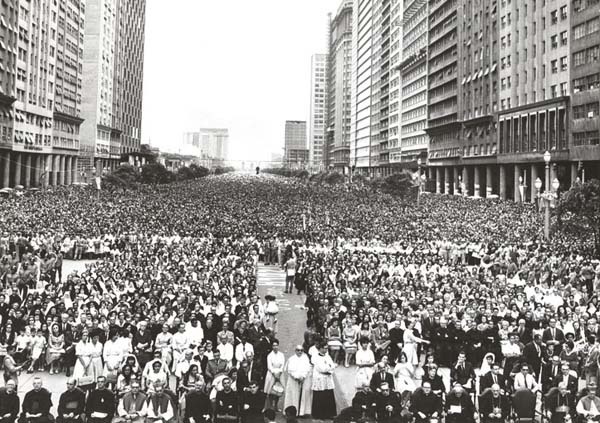 A Rosary Rally was the culmination of many important events. It was a whole community approach. Father Peyton referred to this process as the Six Mountains. 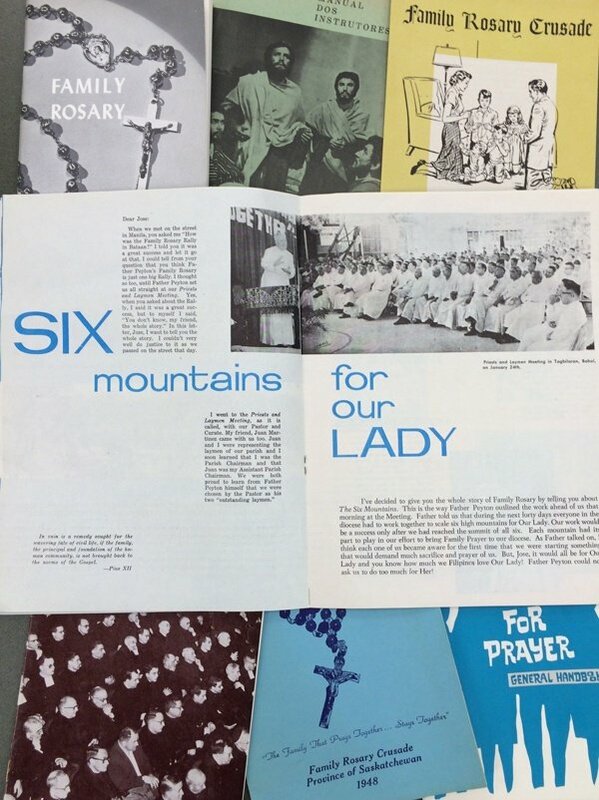 Samples of Six Mountains handbooks from various Rosary Rallies around the world. 40 Holy Hours were planned and all were welcome to offer their Holy Hour to Mary, Our Lady, for the success of the Rally. 40 Masses were offered and all were welcome to pray to Mary, Our Lady, for the success of the Rally. Homilies were given by local priests about the importance of Family Prayer and to encourage participation in the Rally. Formation of men and women/educational program - Pledge cards were distributed to and received from families promising to pray and attend the Rally. Hospital and Prison Campaign to encourage prayer. Visitations were made and people were asked to offer their pains, fears, sufferings, etc. for the success of the Rally. 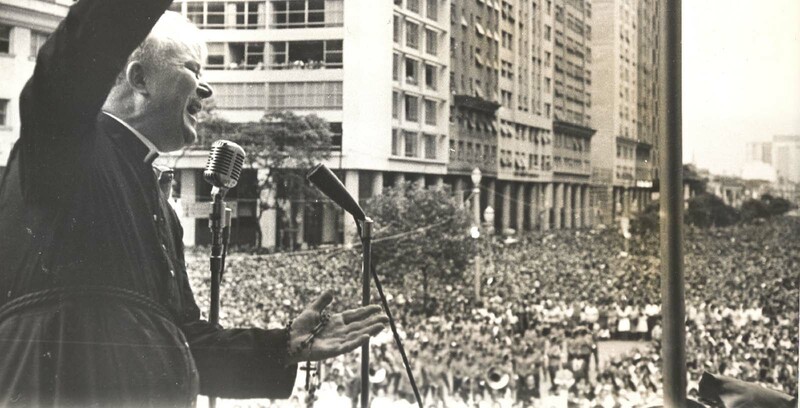 Father Peyton, Rosary in his left hand, at the Rosary Rally in Rio De Janiero, December 16, 1962. Below we'll take a look at one Rosary Rally as an example to understand Father Peyton's whole-community approach to organizing a rally. 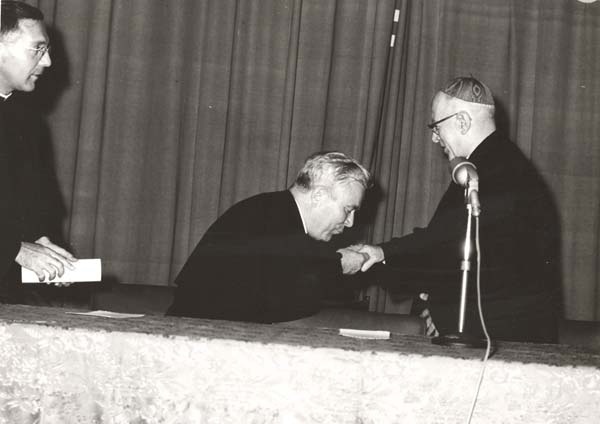 Father Joseph Quinn, C.S.C., looks on as Father Peyton greets the Cardinal. Father Peyton contacted Cardinal Dom Jaime de Barros Camara and the Cardinal gives his blessing and support. A meeting is held with the parish priests. 40 Holy Hours, 40 Masses and Homilies are planned in parishes. 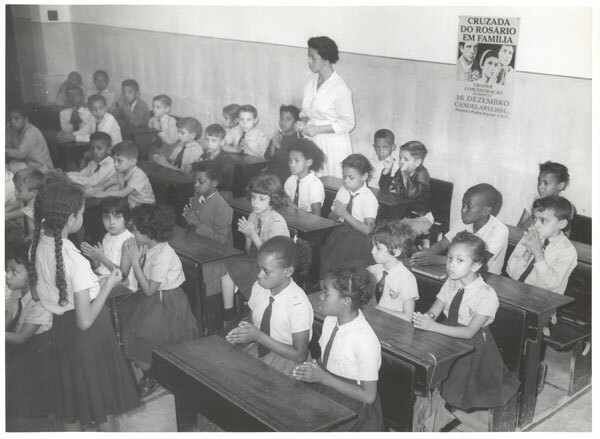 School children learn about the Rosary. Presentations, including stories and films, in schools to reach 600,000 children. Prisoners view the 15 Mysteries of the Rosary films. Hospital Campaign - 24 hospitals with over 6,000 patients were in attendance. "Very impressed by the divine drama." 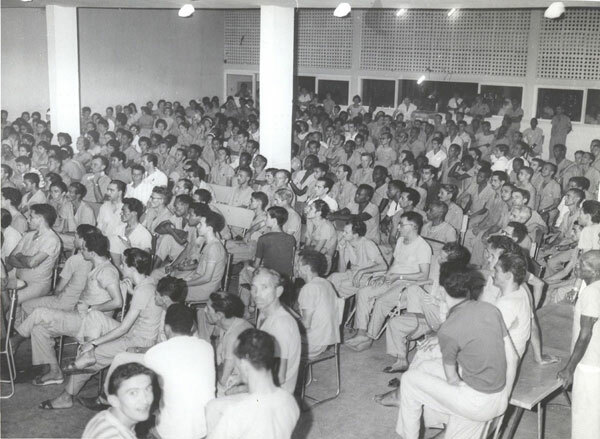 Prison Campaign - In addition to other prisons, at the Brito Prison, 500 of the 700 prisoners attended the films. Letter read in all churches, mentioned in 15 newspapers, and announced on all 3 TV channels and 10 radio stations. 474,500 pledge cards were given to the parishes to be signed by the families promising to have daily prayer in their homes. Publicity Campaign begins: 962,450 publicity materials. Some sponsors included Coca-Cola, Texaco, Ron Bacardi and Gillette. The Rally as Father Peyton would have seen it, with people as far as the eye could see, lining the streets to hear about the promises of the Family Rosary. 1 million signed pledges to pray as a family!